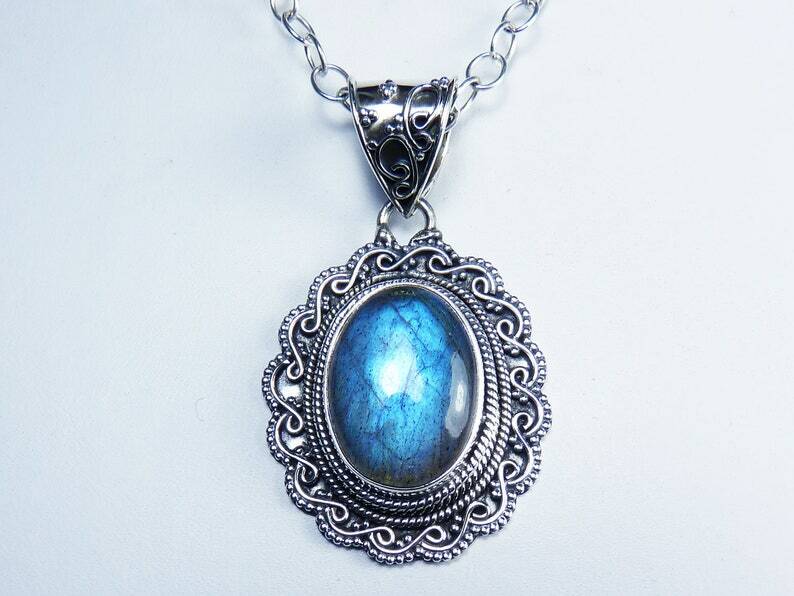 Flashy turquoise blue labradorite necklace with heavyweight sterling silver filigree bezel and bail. A perfectly smooth labradorite oval cabochon is set in a stunning, heavyweight, filigree, sterling silver bezel, and the gem flashes with vibrant turquoise blue from many different angles as it catches the light. The front of the gem is rounded, and the back is flat. Like all the labradorite jewelry in my Etsy shop, this is a natural and untreated gemstone. The bezel-set labradorite pendant measures 29mm x 25mm x 8mm (1 3/16" x 1" x 5/16"), not including the ring soldered to the top of the bezel. The labradorite oval by itself is 19mm x 14mm (3/4" x 9/16"). The bezel-set gem is suspended from a beautifully detailed, heavyweight, sterling silver bail, and the pendant dangles 44mm (1 3/4") from a substantial sterling silver chain that fastens securely with a large sterling silver lobster claw clasp. The necklace is shown with a 17" chain in the photographs. The pendant is removable, so you can also use the luxurious chain with other pendants that have large enough loops or bails. This labradorite pendant necklace has a spectacular bezel and bail, and the gem flashes and glows with stunning shades of blue!